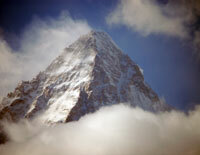 With a span of good weather days, teams have made good progress across the Karakoram, including K2. Talk is starting of potential summit days in about a week. AND it looks like there was another summit on Nanga Parbat! The primary reason climbing 8,000-meter Hills takes so long is weather. You can acclimatize at home to 17,000-feet using altitude tents but you cannot control the weather. The Karakorum and Nanga Parbat season started with a lot of snow that slowed teams down, but recently the snow has calmed down as have the winds – in other words – perfect conditions to set the route and sleep at altitude for acclimatization purposes. However, this nice period will surely come to an end. Climbers are planning for another set of poor conditions late next week. Nanga Parbat – Another Summit! Maya Sherpa‘s “First Nepali Women Expedition 2018 to Mt Nanga Parbat” appears to ended her effort joining Mike Horn, Alex Gavan and Tunc Findik who were stopped this season. We hope to complete the route set up till C4 by today. Yesterday was a nice weather and Sherpa were able to open the route up to 7650m (150m below to the C4). Next 2 days weather is a kind of stable but definitely the summit push will be after 19th July, Hypothetically as per weather report the wind remains (60-80 KM/H) from 16th. Japanese climber Akira Oyabe has a similar schedule, “From the weather forecast, 7/19-23 is going to be attack on the first summit.” And K2 skier Andrzej Bargiel continues to make progress saying he made it to C3. Broad Peak – Weekend Summit Push? After several false starts plus an aborted serious attempt, several climbers, and teams, are hoping to give BP another try over the next several days. Fredrik Sträng posted on Friday, 13 July, “In 3 days from now on you will know how it all went :)” He has been climbing with David Roeske so I assume they will team up on this attempt. By the way, their real objective is K2, so they might not push too, too hard on BP. Mingma G Sherpa who has made quite a name for himself the past few years with multiple 8000-meter summits in short time frames is back on Broad Peak. Last year he believed he summited Broad but GPS tracks and lack of convincing photos suggested they reached the fore-summit, so similar to his experience on Nanga Parbat, he is returning to make sure he stands on the absolute top. He posted that he leaves for the summit this weekend. With his strength, the other teams may be able to join forces and get this done for this season. Adam Bielecki and Jacek Czech have made excellent progress on GII all the way to C3. Its being reported they will go for the summit on 16 July, Monday fearing incoming weather later in the week. They will team up with Kazach Boris Dedeszko and Germany Felix Berg. We came out with a lot of uncertainty, because this attempt took place after a large snowfall, and the road on the GII is snow-ice. To our surprise, it turned out that two Frenchmen with Masha Gordon came out to the second camp. It must be emphasized that they did a great job, because they broke the way to the “two”. We and Jack came that day a little higher and we pitched our little tent. There were no handrails and quite deep snow, but the cover was fairly stable. This could be a nice weekend for summits as long as the weather holds. Sending all our best. Awesome news, can’t wait for the next updates!